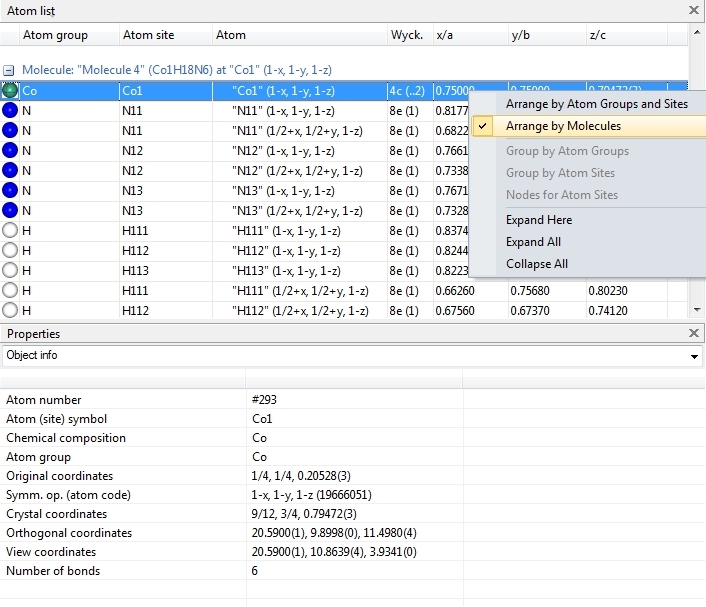 The tables in the data pane right beneath the structure picture, such as the atomic parameter list, the lists of created atoms and bonds, rsp., have been extended for the table of created molecules, where every molecule in the structure picture is listed. Another, new kind of table is the "Atom list", which either shows the created atoms grouped for atom sites and atom groups, or arranged by molecules. 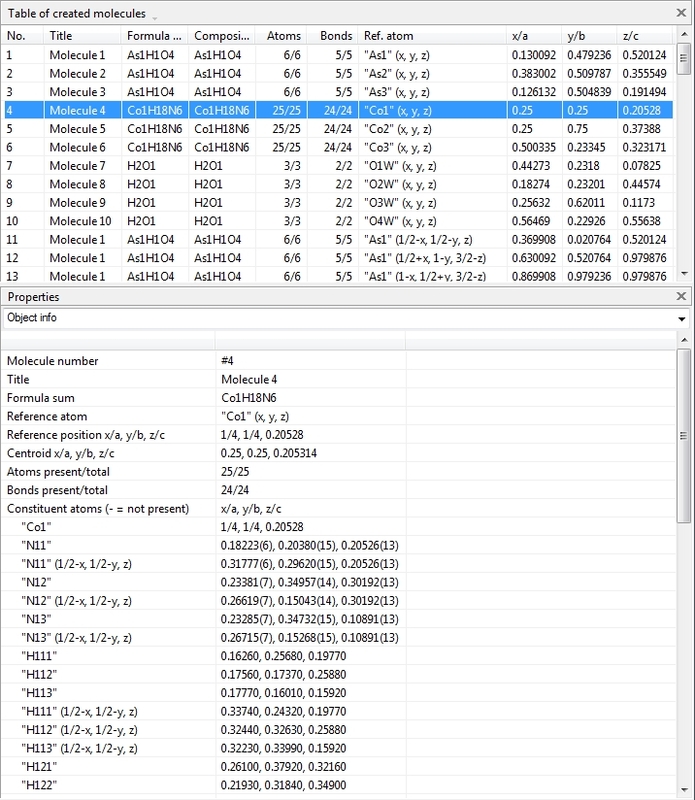 Tables for several kinds of data have been occupying the data pane right beneath the structure picture since version 2 of Diamond, such as the atomic parameter list, the lists of created atoms and bonds, rsp., and many more. Some of them to be used to easily select corresponding objects in the structure picture or (vice versa) to show infos about the objects currently marked in the structure picture. These tables have been extended for the table of created molecules, where every molecule in the structure picture is listed -- whether it is complete or just fragmentated (or just one or two atoms of the molecules have yet been created). The first screenshot shows a packing diagram, containing 80 molecules, of compound COD: 1500005: Hexaammine cobalt(III) hydrogenarseniate tetrahydrate; Ritu Bala, Raj Pal Sharma, Rajni Sharma, Juan M. Salas, Miguel Quiroos, William T.A. Harrison; Journal of Molecular Structure, 828, 174-180 (2007). 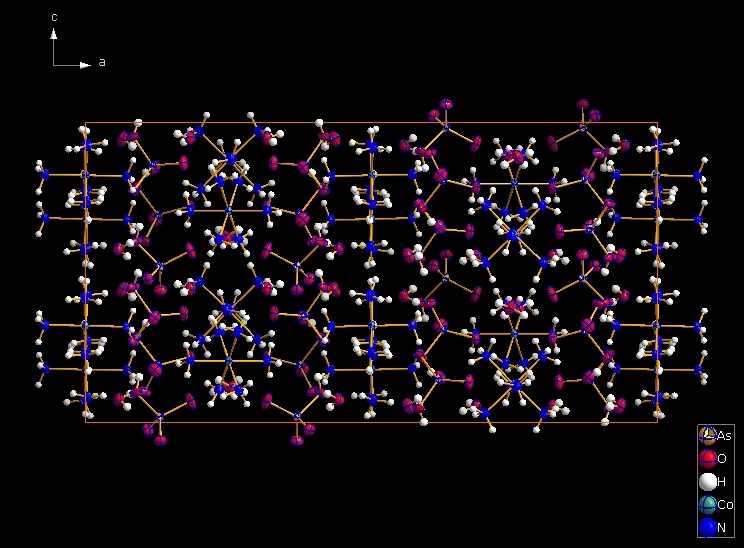 The second screen shot has been taken from the data pane, containing the table of created molecules in the upper and the properties of the highlighted "Molecule 4", the hexammine cobalt molecule with "Co1" at x,y,z as reference atom, in the lower half. A new kind of table is the "Atom list", which either shows all atom groups and their atom sites as well as their associated (symmetry-equivalent) atoms currently in the structure picture. 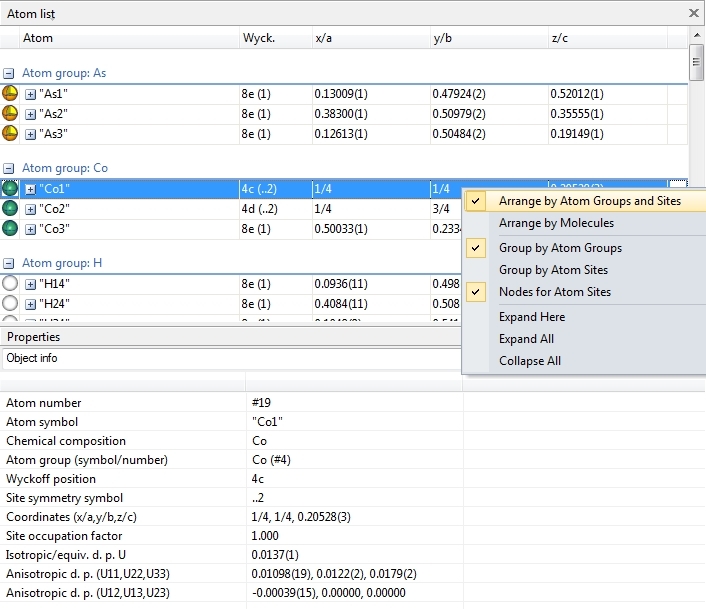 It contains informations from both table of atomic parameters, created atoms, and atom groups in one table, with several options to group or indent. Or it shows all molecular units (the molecules derived from the atomic parameter list, using the current connectivity settings) and their constituent atoms -- whether they are present in the structure picture or not (yet).